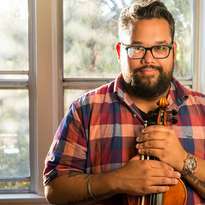 Vijay Gupta is a violinist and social justice advocate. An esteemed performer, communicator, educator and citizen-artist, Gupta is a leading advocate for the role of the arts and music to heal, inspire, provoke change, and foster social connection. Gupta is the founder and Artistic Director of Street Symphony, a non-profit organization providing musical engagement, dialogue and teaching artistry for homeless and incarcerated communities in Los Angeles. Recognized for his “dedication to bringing beauty, respite, and purpose to those all too often ignored by society while demonstrating the capacity of music to validate our shared humanity”, Vijay Gupta is a 2018 John D. and Catherine T. MacArthur Fellow.